Perth Radiological Clinic is a leader in providing medical imaging services throughout the Perth area. In addition to operating 19 clinics it also provides medical imaging to eight hospitals, for over 4,000 general practitioners and specialist referrers. With a typical computed tomography (CT) or magnetic resonance imaging (MRI) scan resulting in hundreds or even thousands of images, the massive amount of data involved was placing considerable strain on Perth Radiological Clinic’s existing storage systems. “After evaluating several alternative storage options, we chose two Hitachi Data Systems (HDS) AMS 2500 storage systems. The physical implementation, logistics and project management were handled by Stott Hoare with HDS doing the actual set-up,” said Joel Adams, Perth Radiological Clinic IT Manager. Unlike some organisations which seek to reduce their storage costs by either selectively keeping only some images, or heavily compressing images with a consequent loss of quality, Perth Radiological Clinic chose to store all images at full quality to ensure the best diagnostic outcomes. “Hitachi Data Systems and Stott Hoare proved that they could deliver the best value solution, as well as the technical expertise and support to solve our business challenges,” said Joel. “Although there are no current regulations specifying how long you must retain images, we made an internal decision to store all images for at least seven years. This adds up to a simply enormous data storage requirement – and one that’s only likely to grow – so capacity and scalability were primary concerns,” said Joel Adams. “High availability was critical, so the solution we were looking for also had to provide fault tolerance, redundancy, and work with our Picture Archiving and Communications System (PACS) replication layer. Perth Radiological Clinic’s previous PACS was HDS-based, but it had outgrown the old system and the direct-attached storage it used in its clinics. “Perth Radiological Clinic’s past experience with HDS technology had been good, and predisposed them towards viewing an HDS-based solution favourably,” said Brian Hawkins, Stott Hoare Sales Manager. At the core of the new Perth Radiological Clinic PACS are two HDS Adaptable Modular Storage 2500 units, one at its primary data centre and the second housed in a new purpose-built secondary data centre. The HDS central storage arrays replaced decentralised storage area networks (SANs) located at each clinic for the vast majority of image storage. Local clinic servers still function as a cache for images less than six months old, but all images are now archived centrally, with a private fibre optic network allowing each clinic and hospital to access them quickly and easily. Another dark fibre optic connection between the two data centres assists in replicating images between both systems to ensure there are always multiple copies of each image online. The images are available to doctors in just a second or two. Brian Hawkins from Stott Hoare explained the rationale behind the choice of HDS Adaptable Modular Storage 2500 units. “These advanced units offer quite an impressive list of benefits,” said Brian. “Importantly, they provide enterprise class storage at a modular price. “Firstly, they reduce management, facility and energy costs – and the innovative Hitachi Dynamic Load Balancing Controller automatically eliminates bottlenecks for outstanding performance. “Each unit is easily scalable to 944 terabytes, with up to 48 SATA or 38 SAS internal disk drives, performance to 900,000 Input/Output Operations Per Second and connectivity to up to 2048 virtual server ports. “The HDS 2500 units are simple to configure and manage, and provide reliable 99.999 per cent data availability – something critical to Perth Radiological Clinic. “They also provide very high levels of compliance and data protection. RAID-6 support means any two drives can fail without data loss, and innovative features such as within-system volume replication or incremental copies, Hi-Track® Remote Monitoring for 24/7 diagnostics and Hitachi Data Retention Utility software really make the HDS Adaptable Modular Storage 2500 units ideal for the data that is absolutely vital to both Perth Radiological Clinic’s business – and its patients’ wellbeing. “Escalating data growth and complex technology infrastructures are familiar challenges for today’s businesses,” said Brian. 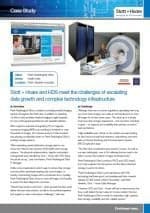 “Hitachi Data Systems and Stott Hoare were able to meet all Perth Radiological Clinic’s needs for capacity, reliability, performance and scalability, and do so cost-effectively and with minimum environmental impact,” concluded Brian. We’ll leave the final words to Joel Adams from Perth Radiological Clinic. “No matter how good the storage arrays HDS may offer are, the proof of the solution is ultimately in the project management and backup. If you’d like to discuss how Stott Hoare can provide a cost-effective, highly reliable and scalable solution for your data storage and access needs – please contact us on (08) 9244 0000.